Have you been? You should go. The reputation of the newly opened restaurant in what my dining companion calls “deepest darkest Hove” spread. Everyone was raving about it. Everyone was going there, even though it was a bit of a trek – to deepest darkest Hove, not the most spacious of places, not well advertised. But the food spoke for itself and it spoke so loud that within a couple of years another branch had opened in Brighton. A year later the owners sold both and moved to a bigger premises at 69 East Street. That was the year Facebook was launched but it was still word of mouth boosting Indian Summer’s reputation. Ten years on, they’ve moved again, next door, to bigger premises again, seating 94 plus 12 outside, when the street is closed to cars at weekends. What is it that got everyone talking? At a time when we regarded Indian food as curry, co-owner Minesh Agnihotri set out to dispel that myth. He wanted to showcase the kind of food his family ate in Gujarat, and other parts of India, where the ingredients are fresh and the cooking is complex, where there’s no such thing as a pot of sauce, but numerous pots, knives and boards, where there’s a lot of simmering, sizzling, chopping and slicing, where the words “tikka masala” are banned and herbs and spices are layered and balanced to create a complex web of flavors. “But it’s not just the food,” Minesh explains. 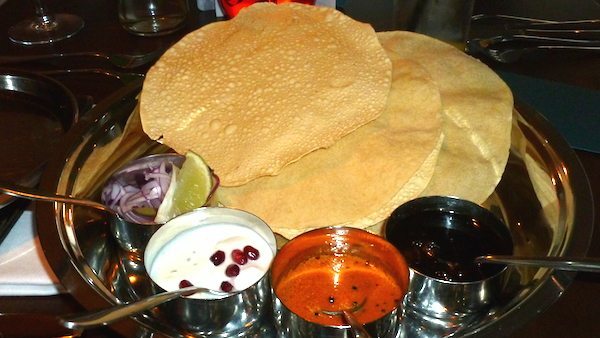 In India dining is an experience. You’re not pleased to be asked to dinner, people are honored to cook for you. We wanted to recreate that, to deliver a truly fine dining experience in Brighton and Hove. Deliver it they have been and continue to do. Walking into the new premise at 70 East St. is a little discombobulating. It’s literally next-door to and a slightly larger mirror image of the old one. You half expect Alice to emerge, clutching Jabberwocky, but she’d be slightly out of place in the spacious dining room, with its wood paneling, alongside sepia images of the sub-continent, lit by discreet chandeliers and with its wide glass doors flung open on what is, when I dine, is the hottest day of the year. We sip ‘Brighton Gin’ (and tonic), with a slice of orange and a chunk of Brighton Rock, as we nibble on lentil papads with a mouth watering selection of dips: onions, raita with black sesame seeds, pomegranate and curry leaf, tomato and pepper dip, and an apple, tamarind and date chutney. All this, while we wait for our starters. 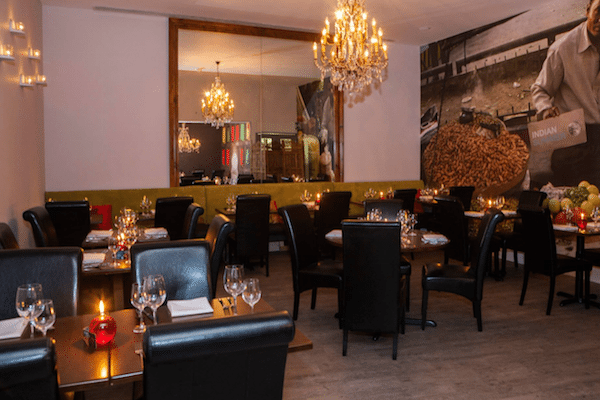 Everything’s freshly prepared on the premises so, while you should allow time for your order, dishes seem to slide seamlessly on and off the table with a couple of amuse-bouche (aubergine and pepper soup and a mango mojito sorbet) in between courses. The menu clearly signposts gluten and dairy free options and vegetarians are well catered for. I’m not one, but I opted for the Onion Auberigne Pakora, a favorite with diners, light, crunchy and perfectly complimented by the coriander chutney and tamarind sauces. My companion goes for Potli Kachori – beautifully light pastry parcels with a spiced pea filling, raita and chutney. It’s a specialty of the chef, delicately flavored and it melts in the mouth. 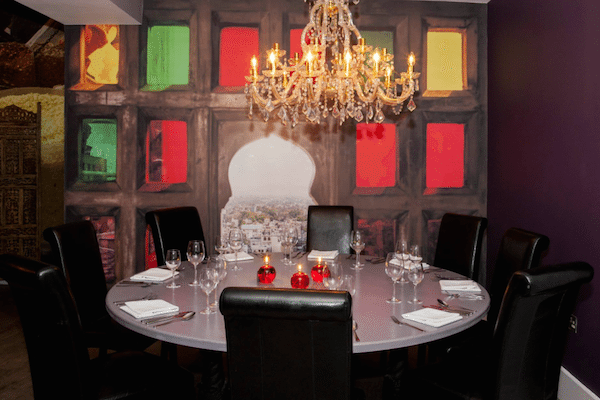 The ethos of Indian Summer is to serve the kind of fresh, intricately prepared food you would be served in India. Minesh originally used recipes handed down through generations to his mother and further developed with the help of chefs from northern Rajasthan and Kerala in the south. If proof of authenticity were needed, it is the story of the Indian Cricket team’s arrival in Hove in 2007. The team was on tour and played Sussex at the County Ground. Whatever they were served initially did not curry (I think I can use the word in this context) favor. Indian Summer was called in to save the day and everyone was happy (unless the you cite the game drawing – but that’s cricket for you). The menu offers a lot of combinations, so if, like me, you’re indecisive and torn, you don’t miss out. 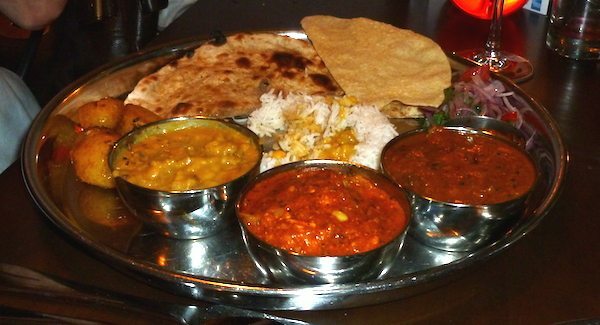 The thali is a favorite and my companion ordered the meat one; a delicious mezze of chicken, lamb and capsicum with dal, papad, pickle, roti and rice. 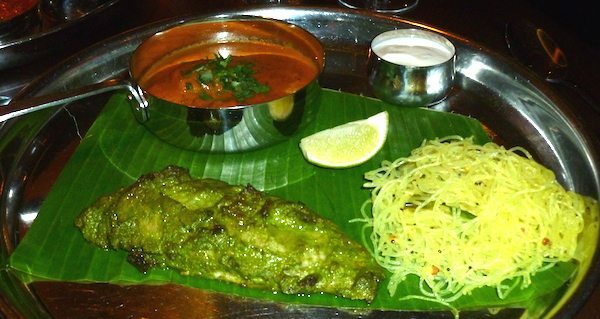 I opted for the Macchi aur Jhinga, a dual dish of king prawns in a curry leaf and coconut sauce and a perfectly cooked fillet of red mullet and noodles. While the menu is regularly updated, there are also some firm fixtures. 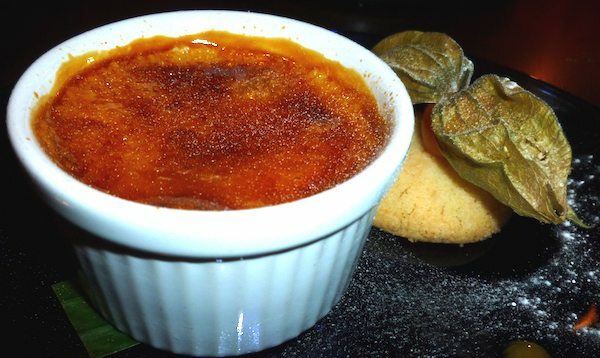 I’m having the mango brulee. My companion remembers this particular dessert from when Indian Summer was in “deepest darkest Hove”. Luckily, it’s still on the menu. It got taken off once but there was a protest. It’s there to stay now. I go with the newer, carrot halwa with white chocolate ice cream, a lighter, less sugary variation on a traditional Indian sweet. Both are delicious.